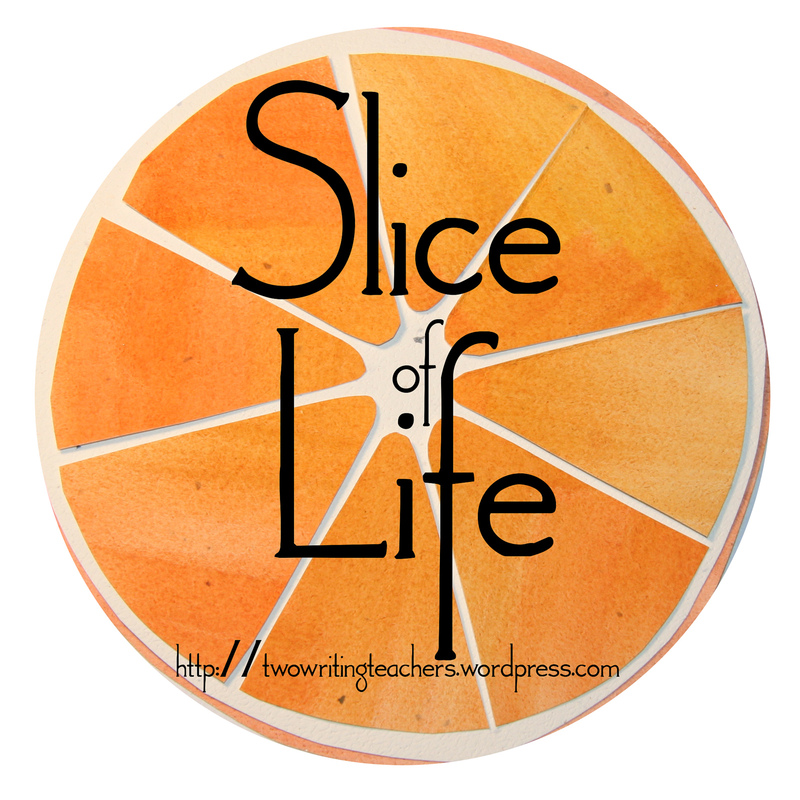 The Slice of Life Story Challenge began on Two Writing Teachers in March 2008. The mission of this online challenge was to support teachers who wanted to write daily. The purpose was to create a community of teacher-writers who could better support the students they serve in writing workshops daily. On March 1st, we’ll host the Ninth Annual Slice of Life Story Challenge. In the weeks to come, we’ll provide you with information about prizes and the Fourth Annual Classroom Slice of Life Story Challenge. For now, here’s some basic information to get you energized for our March writing challenge. In an effort to help you get started with Slicing, Beth created an infographic. It contains basic information to help you get ready for the March Challenge. If you have questions after you read it over, please contact me, Beth, Betsy, or Dana since we’re the co-authors who are hosting the individual challenge this year. If your last name begins with the letters A – G, please email questions to Beth, beth [at] elizabethmoore.work. If your last name begins with the letters H – M, please e-mail questions to Betsy, betsymhubbard [at] gmail.com. If your last name begins with the letters N – S, please e-mail questions to Dana, danamurphy143 [at] gmail.com. If your last name begins with the letters T – Z, please e-mail questions to Stacey, stacey [at] staceyshubitz.com. Please use a permalink (aka: unique URL) when you link your posts. To find this link, click on the title of your blog post. The permalink will appear in your browser. Copy that entire link so you can paste it into your comment when you leave a link to your slice of life story at TWT. 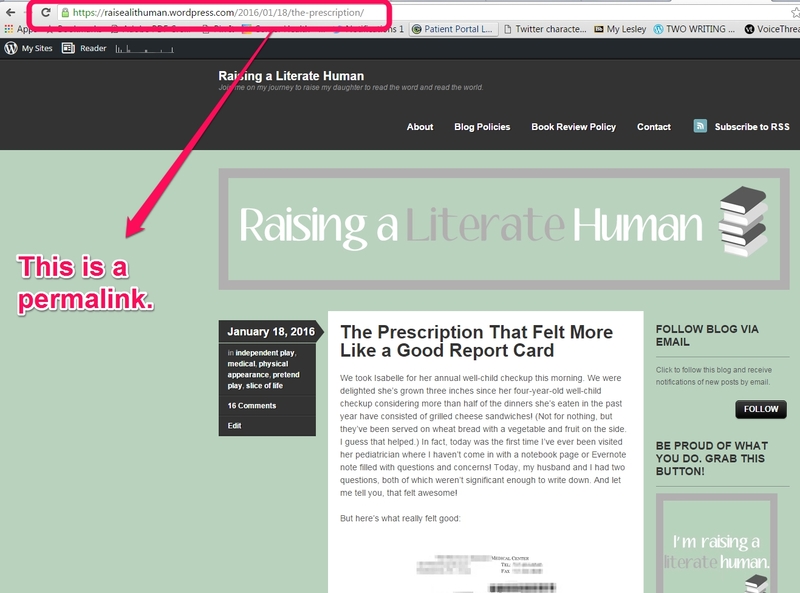 Leaving a new permalink every day will provide readers with a perpetual link to each of your blog posts. In addition, if you write and link your slice daily in March, you’ll be in the running for a prize. Your permalink serves as proof that you wrote daily. Please join us for a Twitter Chat on Tuesday, February 16th from 8:30 – 9:30 p.m. EST. Most of us will be on-hand to answer your questions about the upcoming writing challenge. Just tweet using the hashtag #sol16. RETURNING SLICER? Read here: If you’ve already participated in one of the previous March challenges, we hope you’ll return this year. Consider inviting a friend, family member, or colleague to participate. Remember: the person doesn’t have to teach writing workshop to be part of this challenge. The primary purpose of the Challenge is to foster a community of teachers who are Writers. That said, we’re open to people from all subject areas and in all stages of life (e.g., working, retired) participating in the SOLSC. We’re in search of Seasoned Slicers to help us with the “Welcome Wagon.” If you can commit to commenting on several new Slicers’ blog posts every day in March, then please sign up to join the Welcome Wagonteam. You will out the participant data form, which will go live on February 21st. You comment ONLY ONCE on the daily call for Slice of Life stories (3/1 – 3/31/16). Bottom Line: We are using the honor system. Please use the same email/username information on all of your March comments. 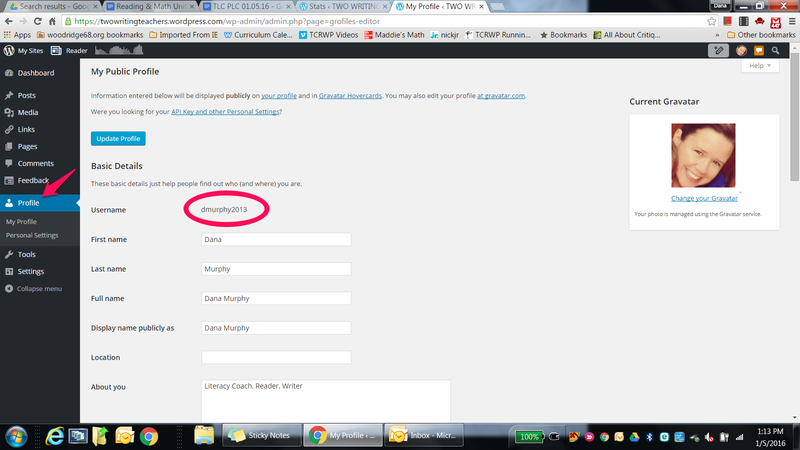 You don’t need to have a WordPress blog to sign-up for a WordPress username. However, having a WordPress username makes it easier and faster to post your comments when you visit TWT. We are using the same comment guidelines as last year. If you haven’t read them, please review them before you do the March challenge. The individual challenge is for educators at any stage in their career. We realize some of you might have a child or a student who you’d like to invite to do the challenge alongside you. If this is the case, then we invite your children or individual students to participate in the Classroom Slice of Life Story Challenge. As of this year, individuals under the age of 18 who are not part of a classroom community must have an adult sponsor to participate. As an adult sponsor, you will be the person who leaves the link to your child’s or student’s blog post, on their behalf, on the daily call for Classroom Slice of Life stories. Tara will discuss this change in further detail on Wednesday, January 27th in her Classroom Challenge overview post. Should you have questions about this new policy, please contact Beth, Betsy, Dana, or me (based on the letter of your last name, as specified above). Finally, we know standardized testing is on the horizon for many of your students. We hope the timing of this test will not deter you from participating in this writing challenge. Furthermore, it’s our hope you’ll be able to find solace in this writing community during what can be a rather stressful time. 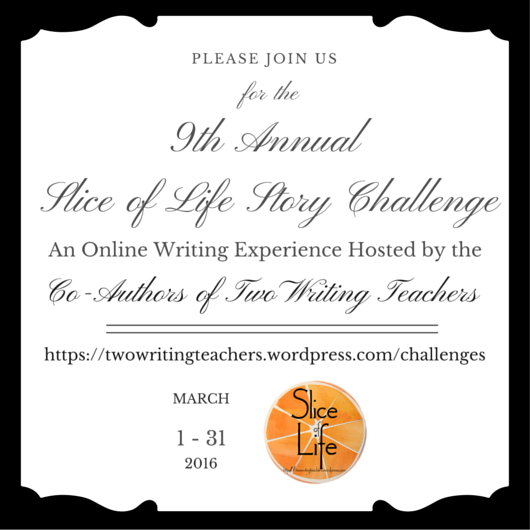 Are you excited about the Ninth Annual Slice of Life Story Challenge? Do you need some motivation to commit? Share your thoughts by leaving a comment. ← Should Educators Be Writers? I’m delighted you’ll be joining us again, Holly. This will be my second year. The challenge of writing every day was great, but reading three other posts was wonderful, too! I learned so much! I’m delighted you’ll be joining us again. Hello! I would like to participate this year. Do I have to set up a blog? What platform do you suggest? Yes, you need to set up a blog to participate. I’m partial to WordPress, so I recommend going that route. Excited to be writing with you all this year! And your new login worked. Yea, Vanessa! Thanks for your encouragement and help Stacey! This will be my second year participating in the writing challenge. Cut WAS SO gratifying to be able to blog consistently for the 30 days. It was the first time I had publicly shared my thoughts and challenges through a blogging experience. It left me so renewed and refreshed. It was a cleansing for me. I LOVE my TWT! Delighted you’ll be back for another month of slicing this year, Terrie. This will be my 6th year – and completed each year. I’m retired, but still writing a lot, and sometimes working with individual students on writing. It is always interesting to read the variety of posts in March – and the group has grown. Any idea of the numbers for each year? I’ll have a better idea once the participant data form goes live towards the end of Feb.
Glad you’ll be joining us again, Donna. Can’t wait!!! Year 2 for me!! Yea! I hope some of your colleagues will join us this year. Last year’s SOL March Challenge was my first. Participating in it lifted me out of depression from cancer and back into a new life filled with writing and a new community to belong to. Thank you Slice of Lifers! I’m glad to hear it was therapeutic for you, Barbara. Glad you’ll be back. The first year I participated I wasn’t sure I could it. This year will be my third year joining this fantastic writing community. Can’t wait. Happy to have you back, Bob. So glad I took the plunge last year. Posting every day gave a big boost to my personal writing. Looking forward to participating again this year! So glad you’ll be joining us again, Rose. I am so excited. I think I have at least one colleague who will be joining me this year! I’m getting excited to participate for my 3rd SOL challenge!! Perfect timing with this post as I’m home digging out of 18inches of snow (Arlington, VA got dumped on!) and will have time to email my staff to see who else might be interested in joining me this year!! Thanks for this challenge. It has transformed me as a Writer!! Fantastic! I hope some of your colleagues will join us. Stacey, I am happy to be a help with the classroom slicers. I’m not sure if you have put out that call for volunteers yet. 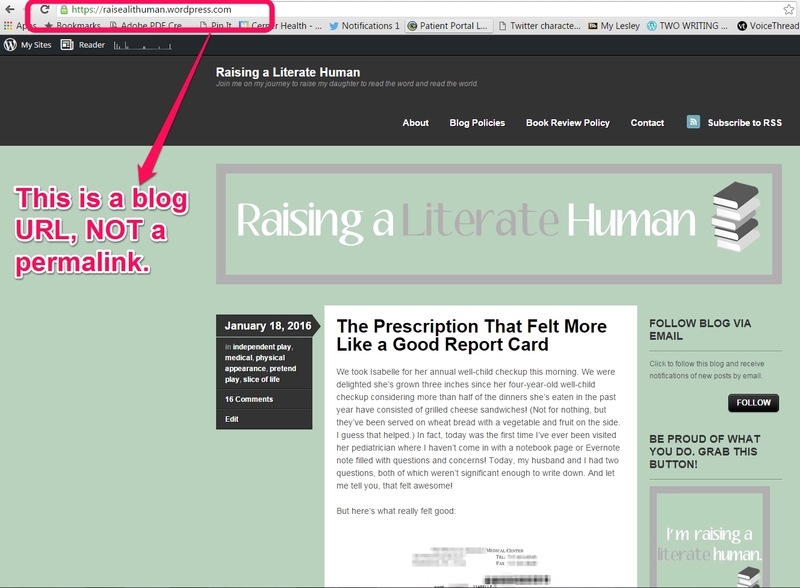 But if anyone needs help with setting up kids for blogging, give them my name. Thanks. I think this is year 5 for me! Tara will be doing the post about the Classroom Challenge on Wednesday. In the meantime, I’ll let her know of your willingness to help. I am so excited to be a returning slicer! Last year was my first SOL Challenge and I really was not sure I would complete it, but I did (so you can too!). I promised myself after March that I would slice regularly each Tuesday (and I think I have only missed two when I was away from wifi). I am also excited to have my third graders join the Classroom Slice of Life Challenge. I have already started dropping hints about the exciting challenge ahead. I have also started checking in with last year’s third graders to see if they were planning to join again and have seen the thumbs go up. That said, it will be a challenge to am again this year, publishing daily is not something that is easy for me, but count me in! I’m delighted you (& your students) will be joining us again, Erika!